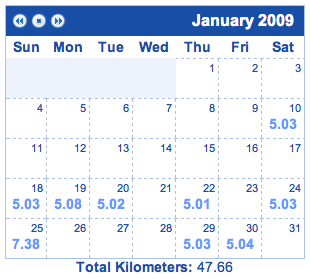 January 2009 is no more and it’s time to tally up on my new habit. January was a bit of disappointment and a success at the same time. I managed to get only 9 runs done in the whole month as a consequence of cold weather (-5C and lower together with ice on the roads) together with a cold/flu. When I did run though, I managed to run further and faster then before. In second half of the month I managed to get all my runs above 5 km (~3.1 miles), which is something I could only wish for in December. Extended length of runs actually managed to get my total sum to 47.66 km. Seeing that I didn’t run for half of month, I’m confident I could break 100km per month goal if I would have a bit of help from weather. Running in a snow is a bit harder than it first seemed. One day snow running is OK, having a few centimeters of snow around all the streets is no fun. I’ll probably have to seriously consider going to a fitness studio so I can run there in February as it snowed again. I’m running more and more without a specific length goal. I go running and then decided each time during the run if I feel like going 5km vs. 3.6km. Somehow I always chose longer one. Somehow I don’t feel like running below 0 degrees Celsius anymore. Anything above that is fine as long as it isn’t icy. I’m confident that with good training across the year, I could run my first half-marathon in fall. I want to do this more and more so it just might happen. I started reading about nutrition and how my diet should look like to optimize my performance. Everything I read up to now made sense to follow even if you’re not an at active runner. hi Jure i have been running since i was 4 and am now getting on for 39 so here is some running advice – alternate your training patterns so you don't get too bored. if you train on distance 1 time train on speed the next that way you rest pecific muscle types for longer and will run faster/further next time. Set goals for time /distance befor e you start and slowly increase both. Create itunes play list for different types of run so fast , motivated or steady. You are more susceptible to flu when you run, make sure you eat lots of stuff with vitamins, and keep you nose warm when you run, i generally wear a buff accross my face. concentrate on lengthening your stride and guickening your pace. Most of running faster / further is in your head your body will try to run at a pace that is comfortable – your head has to tell your body to run faster all the time, your body then gets used to the faster pace, and agin your head needs to move it up again. buy a watch with a heart rate monitor, that way you can get a better idea of just how hard you are trying, aim to keep your heart rate consistent throughout your run that way you are always putting in the same effort whether runing on the flat, up or down. finall log your runs and routes on either mapmyrun.com or fetcheveryone.com etc these let you mark out your routes and give you exact distances, so your time per mile and personal bests are recorded. hope this helps and well done on 4 months. if your in newcastle for this years thinking digital, might even do a training run with you.